Local author Peter Fulton has just come out with his second book, Channelsurfing, a dystopian comedy based on the theme “what would it be like for a society that never dies?” It is now available as an e-Book on Amazon. Fulton grew up in the east end of the Beach community around Fallingbrook Road where he lived since he was eight years old. He went to Trinity College School in Port Hope, and has a Bachelor’s Degree in Drama from Queen’s University. Today, he still lives in the Beach. “Yeah, I live close enough that I can chuck a rock out my window and hit the sand,” he said. Growing up, Fulton always knew he was a writer at heart. He took an interest in writing in high school at about age 16 and even wrote his first novel that took him an entire year. He stated that it was horrible, but even so it did help him learn and grow. His first book, How to Survive Your Death was published in October of 2016. It is also based off that same theme of a society that never dies, but in a very different way. At heart the book is two love stories: one the love of mother and daughter, the other, the love between vampire and vegetarian man, its bittersweet really. It’s a chilling story full of humour and despair, with several great reviews on Amazon. Each book took Fulton more than a decade to write. How to Survive Your Death taking 12 years while Channelsurfing took 15 years. Unlike How to Survive Your Death, Channelsurfing depicts a futuristic world where the government has won the drug war, solely by turning it around onto its citizens, as they become both manufacturer and pusher. In Channelsurfing, each person has their own reality show, broadcast by the government otherwise known as The Network. Upon turning 18 everyone is given the chance to choose The Cure, a pill that allows you to live 150 years disease-free until painlessly plugging out on their 150 birth-episode. Even though these two stories revolve around the same theme, they share little to no similarities between them. Sarah is an immortal being, following the whole immortality trope, while Channelsurfing is a trapped society, reliving the same lives constantly until their show ends. But with The Cure also comes the death of all emotions, so people are free to prescribe themselves any drug they would like, be it Happiness, Ecstasy, Love, even Will-Power. The plot and general story of the book itself is very surreal; a world trapped in a glass container to protect those who live in it from the nuclear fallout outside. Yet is also relevant to what is going on in the world right now, with everyone being so media obsessed and to sell out their own privacy for fame and judging themselves based on how many ‘likes’ their posts get. Most people would expect a story like this, a story so wild sounding and imagination-heavy, to have a deeper, hidden meaning, but really there isn’t much more to it from a message standpoint, said Fulton. He said that he doesn’t believe a book or story should have a message. Therefore his does not, because all he is trying to do is write a good book. “Messages are the death of art,” he said. Writing really is just another form of art, a beautiful mess of words strung together to create a whole new universe. “Tell the story how it is, even if you don’t agree with it,” said Fulton. He said his writing career began in high school. “In high school my teacher, Dr. Dubroy, gave us a two-page writing assignment. I thought I could do more than that, better than that, so I wrote a 20-page story in one night and handed it in,” he said. However, these works tell the story in a completely different way than his other books. 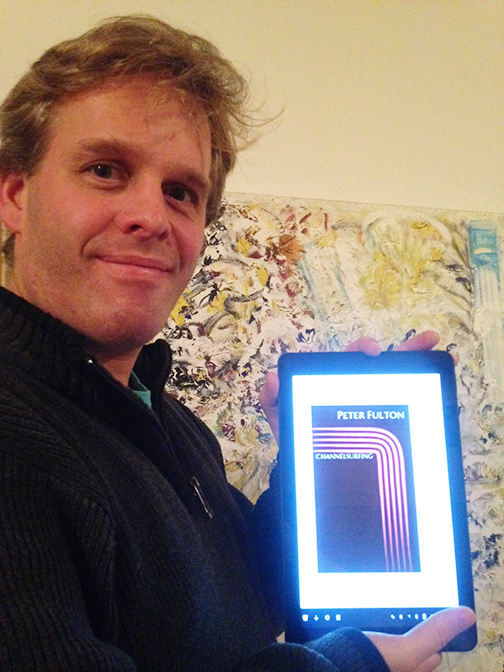 If you want to buy the book you can check it out on Amazon at https://www.amazon.ca/Channelsurfing-Peter-Fulton-ebook/dp/B07K62XQMK, or search ‘Channelsurfing Peter Fulton’ to find the Kindle edition of the book for about $8.52. You can use the free Kindle app on any device, and Amazon also provides a small sample preview of the book for those who are potentially interested.